As the term ICIC stands for, it is a type of technology which is designed to reduce the interference created by two or more cells. In which situation do you think a UE suffer most seriously from this kind of interference ? We can easily think of following cases. Case 1 : UE is in cell boundary of a cell. In this case, the signal from neibour cell can act as interferer. In this case, signal strength from serving cell tends to be very weak and at the same time SNR would be very poor not only because of the weak serving cell signal but also because of the interference. Case 2 : UE is under a coverage of a femto or pico cell. In this case, the Macro cells around those pico/femto cell or other pico/femto cell can act as interferer. In this case, the signal strength from serving cell may not be such a weak, but SNR tend to be poorer due to the interference. Case 3 : UE is located close to a CSG cell, but it is not the CSG member of that cell. In this case, the signal from the CSG cell act as very strong (sometimes stronger than the serving cell itself) and can be very problemetic (This would be why 3GPP 36.300 take CSG as an important criteria for ICIC/eICIC implementation). There has been a lot of discussions about the solutions. Following is a kind of baseline idea on the approaches to solution from R1-104942. Some of them has been adopted in 3GPP specification as of now (36.300), but some of them are not reflected in the spec or still need further clarification. But I quoted the full list from R1-104942 to give you broader idea on possible solution. For further details, refere to R1-104942. I think the items marked in blue is reflected in 3GPP spec now. Frequency domain solution is not precluded. 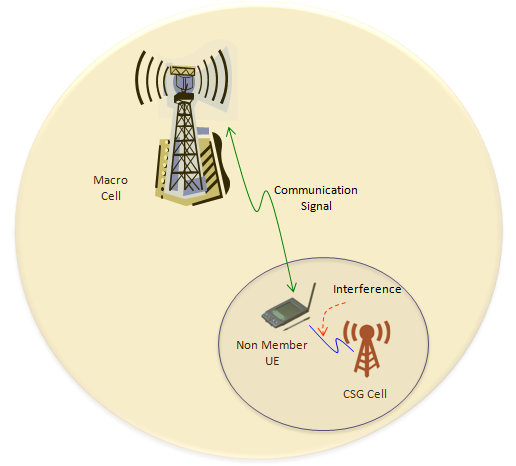 As you know, LTE signal (actually most of the communication signal) has two components. 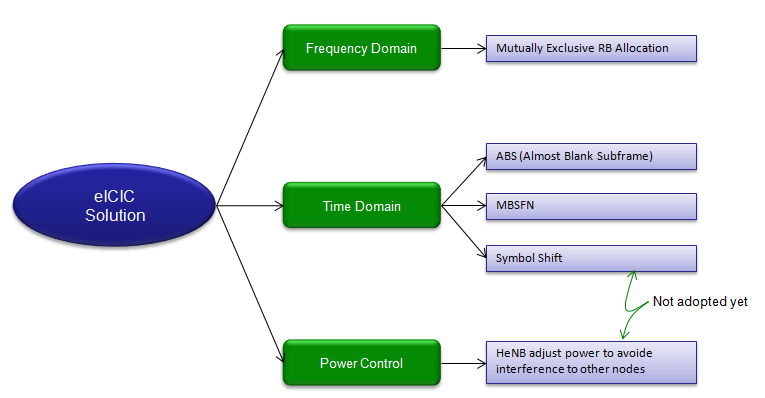 Time domain component and frequency domain components. 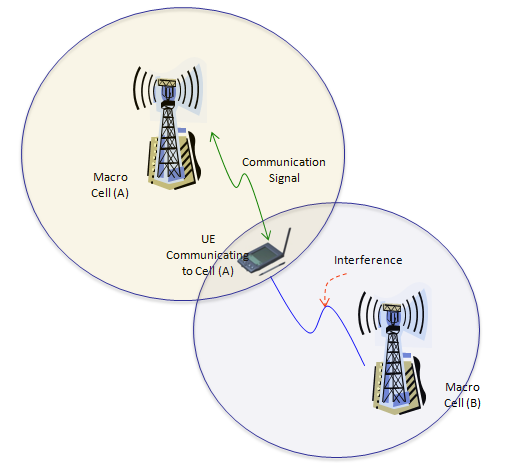 So the interference can occur in both domains. Now we have to think about how we can reduce the interference on Frequency Domain and Time Domain. In Frequency Domain, one way to reduce the interference would be to allocate the resource blocks from multiple neighbouring cells in such a way that the allocated resource blocks does not overlap each other. For example, if a cell (e.g, serving cell) allocated RB0~10 for a UE, let neighbouring cell allocate RB 15~20 for another UE. In Time Domain, one way to reduce the interference is that a cell (e.g, serving cell) stop transmitting at a certain subframe so that other cell (e.g, a femto/pico cell) can transmit the signal during that period. But sometimes completely stoping the signal transmission would cause some issues. So it would be recommended to transmit the signal in very low power in stead of completely stopping the transmission. These subframe with very low signal power is called 'Almost Blank Subframe (ABS)'. Does this illustration make sense to you ? First think on your own about what this illustration indicate before you read the following. Now look at the upper track figure showing the resource grid and focus on the yellow color resource blocks. Left one is the resource grid for eNB1 (left) and Right one is the resource grid for eNB2 (right). The yellow color resource block are the ones that user data is being transmitted. If you compare the yellow color Resource block of the two resource grid, the position never overlaps each other. It means for each symbol the user data from two different eNB is being transmitted in different subcarrier (different frequency) so they do not interfere each other. Now let look at the lower track. These plot represents the cell power for each subframe (time domain). The tall/wide bars represents the subframe where user data is being transmitted in high power and the small/narrow bars represents ABS subframe that carries only fundamental channels without any user data. In this plot as well, you would notice that both cell transmit user data in certain symbols, but the subframe carrying the user data does not overlap each other. These two tracks of figure shows fundamental mechanism of eICIC. Upper one shows how to reduce the interference in frequency domain and Lower one shows how to reduce the interference in time domain. In current 3GPP test specification, only time domain method is adopted but frequency domain method can be applied depending on situation. 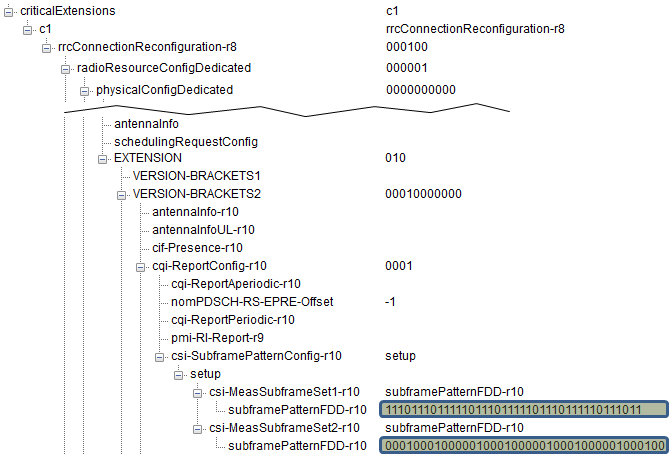 As I mentioned above, the most important way to implement eICIC as of now is to use ABS (Almost Blank Symbol). The ABS is not a simple turning off certain channels. It is specific composition letting the most fundamental channels (e.g, Sync Channel and Confrol Channel) still detectable by UEs but minimze the interference. 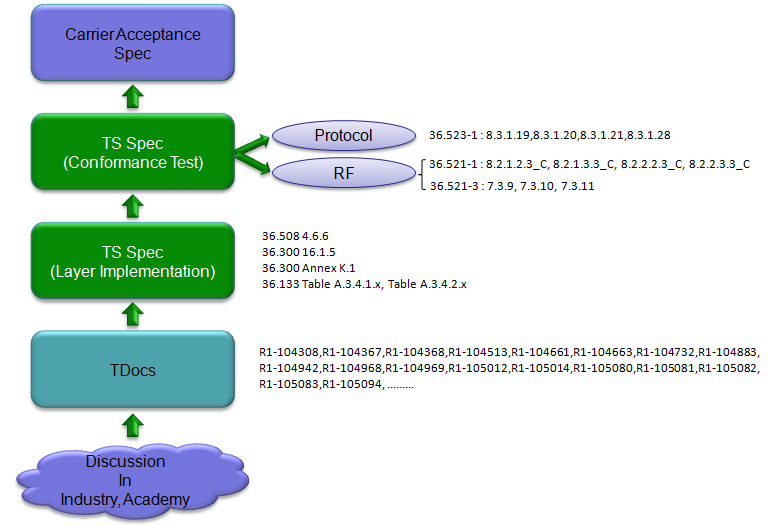 Following table shows some example of ABS channel composition defined in 3GPP specification. But in real application, these composition would vary depending on situation. In terms of signaling point of view, eICIC is a dedicated channel process. It means a specific configuration information need to be exchanged between UE and the network via signaling messages for each specific UEs. The first step is for a UE to inform the network of whether it support eICIC or not. This information is carried by Feature Group Indicator (FGI) in UE Capability Information message as indicated below. If network confirms that a specific UE is capable of eICIC, it can inform UE of more specific information about its eICIC configuration. One example is about measurement subframe information as shown below. With this information, network tells a UE "I am configuring this and this and this subframe as ABS to reduce the interference, so don't try any measurement for such subframe". You can send a similar information about csi-Measurement as well by following information element. 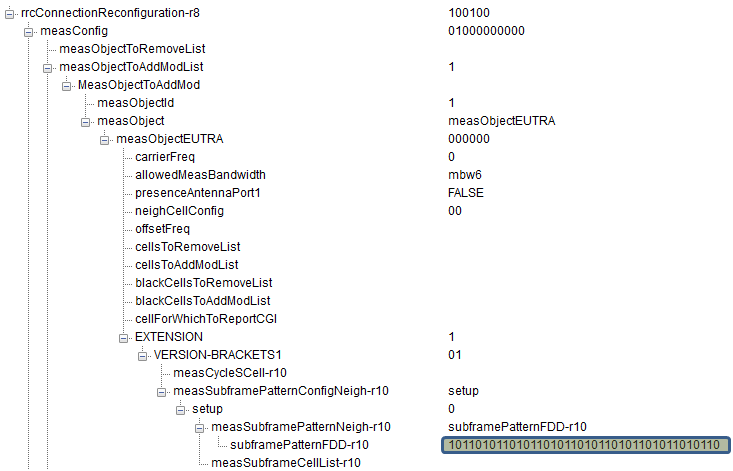 Here you see two different sets of csi-MeasSubframetSet. If subframe patterns for CSI (CQI/PMI/PTI/RI) reporting are configured (i.e. 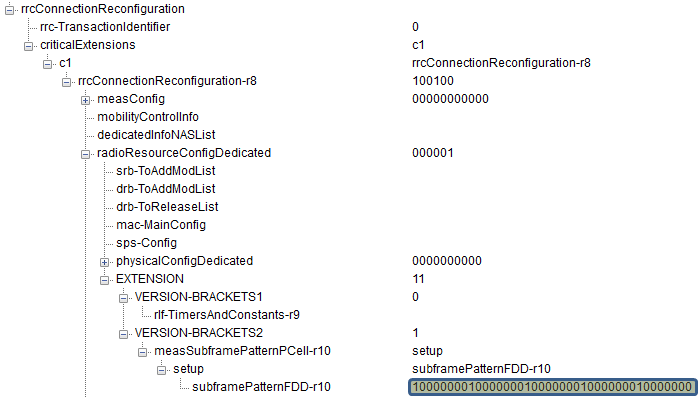 csi-SubframePatternConfig is configured), the parameter applies to the subframe pattern corresponding to csi-MeasSubframeSet1. Following is 3GPP Test cases to test eICIC, but as of the latest release (ETSI TS 136 521 V11.2.0 (2013-10)), the specification is not finalized yet. So just try to understand overall test logic. 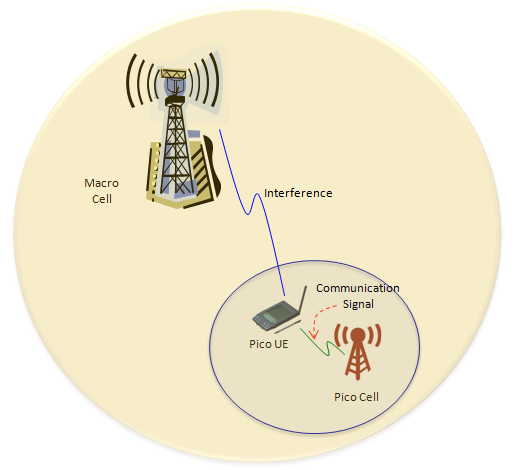 Actually eICIC is a huge topic covering from physical layer to signaling layer, and it is hard to describe all the details in this post. If you want to know further details of this technology, refer to the specification as summarized below. As you know, 3GPP TS specification is very dry.. it just say "Do this, Do that" and does not say anything about "why we need to do this ?". If you are interested more in technical background rather than dry instructions, I would recommend you to read TDocs first. If yout think it is too simple, I think I misled you by providing you with too high level picture. In engineering, Nothing is as simple as it sound -:). If you want to go a little bit more details than the previous one, please refer to following introduction. If you want an extreme details, please refer to following article. 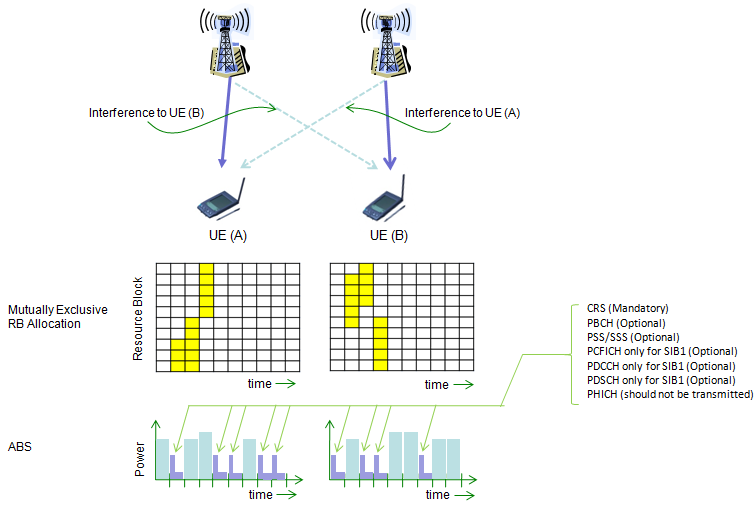 Bell-Lab : Algorithms for Enhanced Inter Cell Interference Coordination (eICIC) in LTE HetNets (If this link does not work, try this). You can find some articles about eICIC (with test equipment and deployed network).